TPLF minority Regime, if lost power in Ethiopia, would secede Tigrean region ? TOPIC: – TPLF minority Regime, if lost power in Ethiopia, would secede Tigrean region? 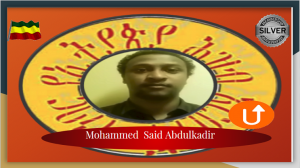 I have forwarded my argument on the debate, I have said that: I want to explain my argument from two sides when Tplf was a rebel and after they became a government. Before, they became a government the evildoer tplf troops have paid their blood to secede the region. As a rebel Tplf would not wish to work with anyone who had consolidation of principles and beliefs about Ethiopia. Tplf had jingoism policy on the Tigray region. However, after Tplf, seize Tigray region in 1981 e.c, They started fighting to occupy Ethiopia as an option and due to the weakness of the military junta, they became a government. After they became a government they have done a lot of jobs to cede the region. They have formed a federation which is very close to confederation. They give constitutional right to secede a region. Furthermore, they have solved several economic issues that would to an obstacle for them to survive alone, they have stolen ten-thousands hectare of the fertile land of Amarigna speakers, They have built the capacity of exporting cash crops, they make the region to be the only region in the country, who has self-sufficient farms. Even though their own constitution ban states not to have its own military, they have build extremely organized military for the region. Thus, the minority Regime of Tplf, if lost the power in Ethiopia, definitely they will secede Tigrean region. I have forwarded my critical analysis on the topic, I have said that: – The violence that occurred in Addis Ababa is part of the flag conflict, some racist supporter of Olf was trying to replace the national flag of Ethiopia by the flag of the secessionist group of OLF. Even Though they are preparing themselves to welcome OLF, they have no right to burn the national flag, that is why they have provoked the residents of the capital for the deadly crash. The confrontation is over the hoisting of flags symbolizing the Oromo resistance movements and painting of road pavements, roads, fences and removing the national flag of Ethiopia by the youth from Oromia and between city dwellers who want to prevent them,” The unfair police of Addis Ababa and the brutal federal police couldn’t control the situation easily. Moreover, the complicity of the deceiver prime minister to the racist groups may take the country to race conflicts and genocides. I can surely tell you that there will be race dispute or ethnic-based attack after the arrival of OLF. We still do not have a reliable government to trust. The ruling coalition does not change its position except the fake talks of the PM, but now he has reached at a point that he couldn’t handle, the honeymoon is over. When he appointed as PM he has accused the military, to deceive the people but now the truth is revealed, he started the usual intimidation. Because he is unfit to address the question of the people. We are demanding democracy, The rule of law must take place in the country. For three thousands of years, Ethiopia never experienced rule of law. There is still no democracy and justice. The army is still abusing the nation. All these atrocities are operated by the army. Furthermore. The deceiver prime minister has no clear vision to rule the country. After his power the race conflicts are increased, the people are losing its unity, the governing system is more close to confederation than the federation. The political system and structure of the government are the same. The corrupt officials are still on power. He fails to arrange the system below the minister levels. So, where is the change? All the visionless drama is to connive at the brutalities of the regime. Ethiopia # ኢንጂነሩን ማን ገደለው Who Killed Engineer Simegnew Bekele? I have forwarded my analysis on the Topic, I have said that: – I am not pro the renaissance dam, as we have seen it in our Mobile university it has a big negative impact. But I shocked by the death of the Engineer, he was a big scholar for the country. I believe the regime is responsible for his death but not directly. Because the corrupt officials have no reason to kill him in the street because of his complicity with the regime. He was not a free man to expose the corruption of Authorities on the dam. He obeys them very well in everything, he even cannot give an interview without their will. Thus, they have no reason to kill him. Whereas they became very close to our strategical Enemies, they open the door to Arabs. Egyptian, who are struggling to stop the construction of the dam, knows what kind of consequence, the death of the Engineer can bring in Ethiopia, which is an ideal to be an obstacle for the dam. So, why not them? The biggest Newspaper of Egypt reported the death of the Engineer as the following “The renaissance dam found dead” why they quoted this way? I strongly suspect the foreign alliance of the evildoer regime of Ethiopia. The officials of Ethiopia are still making a drama, the Prime Minister used to tell us that he warned resignation for the release of Andargachew but as the same time he told us he tricked the officials to take the power. So, how his resignation can be a warning to them if he tricks them to get the power? Whereas, he even wants to tell us that he received a summon from the court before he became prime minister. Everything is not more than a drama. TPLF minority Regime, if lost power in Ethiopia, would secede Tigrean region? I have answered the arguments of others on the debate,I have said that: – In the debate, we have heard a lot of arguments, none of them are challengable though. Our assertions have to be based on logic and facts. For example, those who are saying the brutal Tplf officials could not cede the region have raised the legitimacy issues but the regime gives constitutional rights to secede regions. Plus, others were saying that the people would let them secede with the land of Amarigna speakers. My answer is when? After the evildoers cede the region it will be too late. Everybody is looking silently for the past 27 years, no one opposed or condemned it. Who claims Alamata? Korem? And other lands. The only claim we have seen in 27 years is that the Welkait case. the rest are still stifled. Therefore, Tplf could secede Tigray region if we see things silently. The other point that raised here they can not steal as they are doing now. We don’t have to forget it is their plan B which means it is still better than nothing. Generally, if we are able to see things logically, the brutal officials of Tplf could secede Tigray region or balkanize the country.